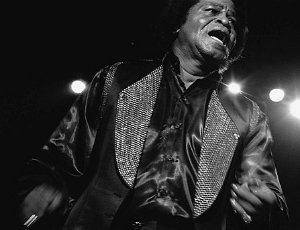 James Brown was a one of a kind performer and a hugely influential musician. With all of that star power, it's hard to remember that he was a father and a husband. He was also a bandleader who provided jobs and support for up and coming musicians—when he wasn't kicking them out of the band due to any number of infractions. It's not possible to do justice to James Brown's fifty year career, but for his 85th birth anniversary, I've tried to cover some of my favorite highlights. When I was younger, my family used to take a lot of road trips, and James Brown was the soundtrack for our drives across the country. If the only James Brown song you've ever heard is "I Got You (I Feel Good)", then you've got a lot of great music to listen to. Start with the extensive box set Star Time to get a broad overview of Brown's oveure. If that's too intimidating, experience him Best of Live at the Apollo. James Brown performed over 600 times on the famous Apollo stage, and this album takes the best of those shows along with a few unreleased tracks to produce a greatest hits record unlike any other. A man who gave himself a nickname is bound to have some things to say about his life. James Brown does not disappoint, with both a memoir and an autobiography to his name. These are packed with stories of his life on the road and what it was like to be a pioneer in the music industry. For a different perspective, James McBride's Kill 'em and Leave delves into the myths surrounding the Godfather's complicated legacy. Hours of interviews, visits to the Southern locales where James Brown grew up, and an examination of the aftermath of his death combine to create a compelling narrative and a fitting tribute to a larger than life entertainer.